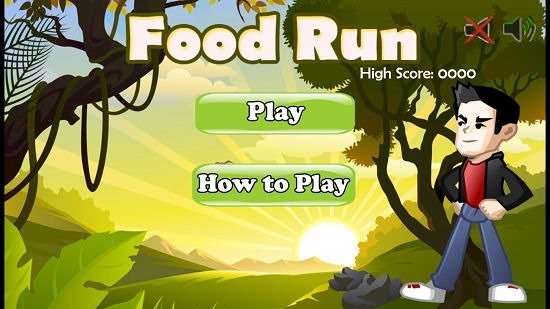 Food Run is a free endless running game app for Windows 8 and 8.1 with a twist. In the game, your player avatar runs automatically, and all you have to do is to make him jump over obstacles via mouse clicks. However, the game isn’t as simple as it sounds. In the game, you have a health meter which constantly keeps on depleting and only increases when you pick up healthy food items like celery sticks or apples along the gameplay. If you jump on French fries or burgers, the health meter depletes in a flash and can only be refilled upon consumption of healthy food items in the game. 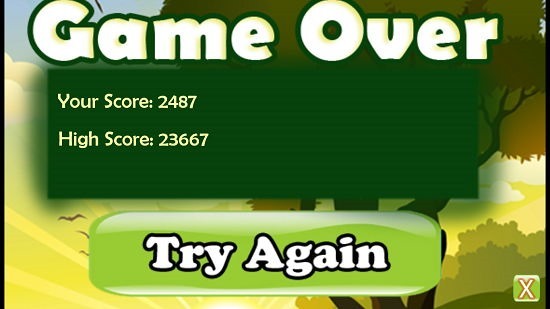 The motive of the game is to not just achieve a high score by jumping over obstacles, but also to maintain a high health level in the health meter. Food Run can be downloaded from the Windows App Store for no charges. When the game is launched, you can choose to tweak the sound settings or start the game via the main menu shown. You can also read about the controls by clicking on the How To Play button. 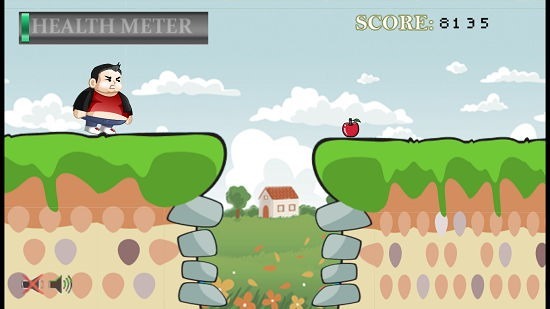 Once the game has been started, you will be shown the below screen where the protagonist of the game will run automatically, and all you have to do is to make him jump over obstacles and unhealthy food so those can be avoided. Towards the top left of the screen is the health meter which keeps depleting as you run. To recharge it, you have to consume healthy food items which you can pick up along the way. The top right corner shows your points. You can jump via mouse clicks. Double mouse click makes the player jump higher and longer, executing a double jump. You can see that as the health meter depletes, you gain fat, slow down and are unable to jump properly. Once the game is over you are presented with a screen displaying your game stats. This sums up the major features of Food Run. Food Run is a great game which can be used on your Windows 8 device to easily while away time. The game is pretty lightweight, weighing in at just about 10 Mb, so you don’t need to worry about excess data consumption. It works great even when your system is offline and makes for a decent ad-free endless runner game.